Junior Emily Litton pole vaults at the Belton varsity meet. 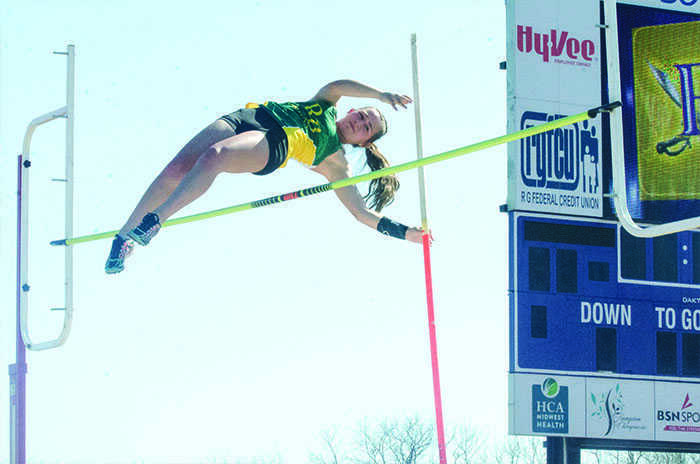 Vaulting nine feet and nine inches, she qualified for the district competition. After lots of hard work and preparation, the girls’ varsity track team gets ready to compete with its contemporaries at the district meet. The girls varsity team along with the boys compete on May 12, at Waynesville High School for the district meet. The district meet gathers the fastest runners from eight schools in the district into one meet where they compete. Head coach Neal Blackburn picks which races each varsity member runs. In previous meets in the season, varsity members had to meet a certain time in their events to qualify and go to the meet. In districts, however, runners have to place top four in their race in order to advance to sectionals, a large meet composed of multiple surrounding districts. This heightened level of expectations makes varsity stay focused. With this extra mark, the pressure runners go through grows even further due to higher expectations. Caroline stevens, who runs relays, hurdles and triple jump, has to fight through the pressure and clear her mind before running relays. Field events such as pole vault are also tension inducing. Things such as weather and wind could ruin events such as pole vault, where you have to use upper body strength and a pole to jump over a bar. Morgan Banker, who is third seed in the district, explains the worries of pole vault at districts and other meets. With previous accolades at the districts meet, the bar is set high for varsity girls to compete at their best. While districts is not important as the two meets that follow it, sectionals and state, it is an important first round of competition that sets the stakes for the upcoming events.